Seemorerocks: Turkish Lira Crashes Through 7 As Erdogan Threatens To Unleash "Plan B Or C..."
An anti-dollar flash mob has been gaining traction in Turkey following the decline of the local currency, caused by Washington’s decision to hit the country with massive import tariffs. US-Turkey tensions continue to escalate over Ankara’s detention of an American pastor and its plans to acquire Russian air defense systems. Videos posted online show Turks setting US banknotes on fire, sneezing into them and tearing them apart. 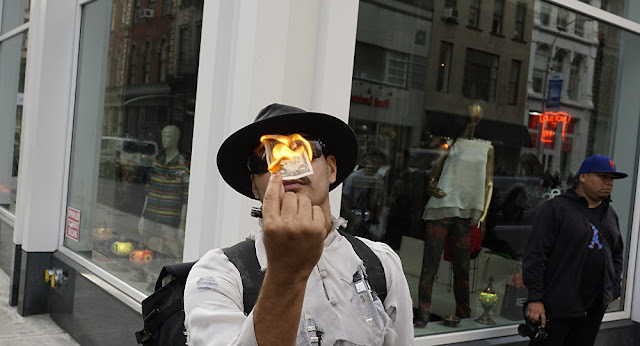 In this video, a man is seen burning a one hundred dollar bill with a cigar lighter. In another clip, several middle-aged men make a bonfire out of US dollar bills. A Turkish official has joined the flash mob. Hollanda’yı portakal sıkarak, Dolar’ın yükselişini Dolar yakarak protesto eden zihniyet ile #AynıGemideDeğiliz ‘Onların doları varsa bizim Allah’ımız var.’ diyenlere hatırlatma yapalım. Yaktığınız doların üzerinde ‘İn God We Trust’ yani ‘Allah’a Güveniyoruz’ yazıyor. The local media reported that crowds of people came together, kissing Turkish lira banknotes and ripping US dollars apart. These protests come after Donald Trump's decision to double import tariffs on Turkish steel and aluminum caused a currency crisis in Turkey, with the lira collapsing to an all-time low against the dollar. The move has sparked a backlash from Turkish President Recep Tayyip Erdogan, who called on Turkish people to exchange dollars and gold for the lira. Relations between Washington and Ankara have been strained in recent years over Turkey's refusal to release American pastor Andrew Brunson, who was arrested in 2016 after a failed coup and accused of terrorism and espionage. In late July, he was released from prison and placed under house arrest, while facing the same terrorism charges. Moreover, the White House has objected to Turkey's plan to acquire the Russian-made S-400 air defense system. Last month, the US temporary halted transfers of F-35 fighter jets to Turkey, taking a month and a half to assess how canceling the delivery of the planes would impact relations with Ankara, its plans to purchase S-400 air defense systems and the US industrial base in the event that Ankara withdraws from the international F-35 program. Ankara has blasted US efforts to disrupt the delivery of F-35s, reminding Washington that Turkey has already paid Lockheed Martin for part of its order for 100 F-35s. Turkish officials told the US that the country has a right to self-defense and explained that it would buy NATO air defense systems if Ankara were to receive an appropriate offer. In the wake of the U.S. doubling tariffs on Turkish steel and aluminum on Friday which sent the Turkish lira and capital markets into free fall, Erdogan wrote a Friday New York Times op-ed cataloging his grievances and threatening to walk away from the decades-old alliance. "Failure to reverse this trend of unilateralism and disrespect will require us to start looking for new friends and allies," he wrote. Meanwhile, while announcing the new sanctions aimed at Turkey, Trump tweeted his "analysis" of the situation: "Our relations with Turkey are not good at this time!" The escalating war of words continued on Saturday, when speaking at a rally in the Black Sea town of Unye, Erdogan said that "it is wrong to dare bring Turkey to its knees through threats over a pastor," and blasted "shame on you, shame on you. You are exchanging your strategic partner in NATO for a priest." At the same time, Ibrahim Kalin, Erdogan’s spokesman, said that the U.S. is "facing the risk of completely losing Turkey." Here one assumes that by "they" Erdogan was referring to the US, even though the Turkish's president official line all along was that the culprit behind the "failed coup" was the exiled cleric Fethulah Gullen who has been accused by Erodgan of being behind the country's imaginary "shadow state" for years, and which gave Erdogan a green light to crackdown on any potential opponents, leading to an unprecedented purge of people in public positions, with tens of thousands of government workers either ending up in prison or unemployed. Erdogan then continued by calling for all Turks to convert their foreign currency holdings, i.e. mostly dollars, to liras, and warning that "economic attacks will only increase Turkey's unity." Among the other notable highlights, Erdogan said that "we will say bye-bye to those who are ready to give up their strategic partnership for their relations with terror organizations" and that Turkey can "respond to those who started a trade war against the entire world and included our country in it by gravitating towards new co-operations, new alliances" i.e. China and Russia (which earlier today said it was considering dropping the US dollar altogether in oil trade), and warned that "it is foolish to think that Turkey can be thrown off by FX" although with inflation set to explode as the currency collapses, the local population may have a different view of this. Finally, anyone wondering which way the Lira will open later today, Erdogan did his best to make the ongoing collapse accelerate, stating that "we know very well that those who say we should make an agreement with the IMF are saying we should give up on political independence", thus eliminating the possibility of an IMF bailout which together with capital controls were the only two options Turkey had left to arrest the lira's plunge. As for higher interest rates, a critical requirement to at least slow down the country's economic descent, Erdogan had some words as well: "
"They are trying to do with money what they couldn’t with provocations and the coup. This is clearly called an economic war"
"Interest rates are tools of exploitation that make the rich richer and the poor poorer. As long as I’m alive, we will not fall into the interest-rate trap"
It was not clear what those tools would be, but they certainly would not be welcome by the market. After all, as Bloomberg reported overnight, investors believe that Turkey’s central bank will have to flout Erdogan’s desires and announce a significant increase to its benchmark 17.75 percent benchmark rate just to stop the currency’s free-fall as it touches levels that had been unimaginable even a month ago. And after Erdogan's latest rant - which clearly crushed any speculation of either more rate hikes or an IMF bail out - foreign investors may have no choice but to pull their capital out of Turkey, transforming what was already an acute currency crisis into a full blown financial panic. In other words, having done nothing while the Turkish financial crisis spiraled out of control first slowly and then blazing fast, Erdogan now finds himself facing a most unpleasant dilemma: damned if he does, and damned if he doesn't.